Urbanista New York review | What Hi-Fi? “Everybody here wanted somethin' more, searchin' for a sound we hadn't heard before” - Taylor Swift, Welcome To New York. That goes some way to reflecting our feelings upon first seeing the most recent pair of Urbanista's wireless headphones to pass through our testing rooms, the New York. Expecting a sound we hadn’t heard before from a pair of mid-range wireless cans is, we'll concede, a little optimistic. But the very least we’re hoping for is good build quality, easy pairing and noise-cancellation, and similarly accomplished sound to provided by the company’s five-star Seattle design. Seattle and New York might be wildly different cities, but Urbanista hasn’t let that influence its headphone aesthetic. The smooth, stylish design is back - but there are some changes too. For a start, the New Yorks have traditional playback control rather than touch controls. 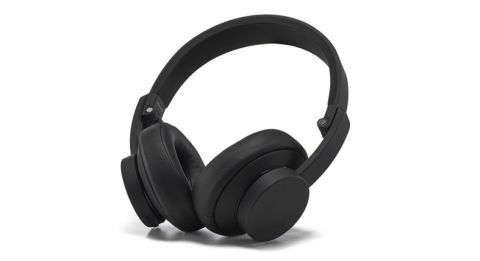 Build quality is sturdy enough and, though the New Yorks aren’t as flexible as some other wireless headphones, they seem equipped to survive being thrown about in a bag or rucksack. The leather earpads feel comfortable – light and comfy, without exerting too much pressure on the ears. Holding down the volume-up button on the side of the right earcup skips to the next track - hold volume-down to hear the previous one. If you want to activate Siri or Google Assistant, hold down the middle button. So far, all fairly standard. If you are using the New Yorks in a noisy environment (such as the Big Apple itself), you’ll probably want to block out the sounds of honking taxis and bellowing vendors. That’s where the noise-cancelling feature comes in - it should be easily toggled on or off by a button on the left earcup. But the buttons are fairly stiff, and require quite a bit of effort. Battery life is a claimed 25 hours without noise-cancellation, 16 hours with, and the Urbanistas are charged by a micro-USB cable. Should you run out of juice, there's a 3.5mm cable included in the box. But when it comes to sound quality, the New Yorks don’t quite perform as well as we expected. On the positive side, they deliver impressive volume. If you like to listen loud, their noise-cancellation is almost redundant - cranking up the volume blocks out virtually all outside noise. But, of course, it's not a course of action we recommend. It’s also a relatively well-detailed listen. We play Where is My Mind? by Pixies and there’s good texture to the stark guitar strums and the hollow, echoing vocalisations that kick the track off. There’s a decent sense of rhythm and timing too. Black Francis’s singular lyrics duck and weave, but these headphones keep them in line. The New Yorks aren’t the last word in authenticity or out-and-out fidelity, but they manage to convey the intention of the track well. However, there are areas where the New Yorks feel like they’re significantly letting songs down. The midrange is one of them. Switch to Kanye West’s Power and, even compared with cheaper headphones such as the Philips SHB8850NC, the Urbanistas don’t convey voices (or the space around them) with the necessary clarity. West’s vocals sound murky and muffled, unable to cut through the deep bass or twitching backbeat as it should. The New Yorks also play bass too loose for our liking – the result is a series of booming rumbles rather than tight-knit kicks. This wouldn't be quite such an issue if the Urbanistas mustered worthwhile punch elsewhere, but unfortunately the results are a little insipid and vague. There’s little reason to endorse the Urbanista New Yorks, unless you prefer their sense of style over substance. The sound quality is adequate in some ways and noise-cancellation is always a welcome feature - but there are many pairs of cheaper cans out there that can do the job better.